McGrath Service Center offers a wide range of automotive exhaust services at our West Milton auto repair shop. 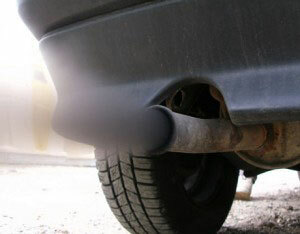 The exhaust system in your car or truck over time has become a combined emission control and safety system. The exhaust system should be inspected regularly and repaired immediately at our West Milton service center if you notice any problems. The exhaust system’s very purpose is to protect a vehicle’s occupants from harmful engine gases by redirecting those gases away from the car to the outside air. The exhaust system also helps to ensure a quiet and peaceful experience by minimizing engine exhaust noises while driving in and around Miami County. Various factors contribute to the wear and tear of your vehicle’s exhaust system, including your driving habits, Ohio road conditions (salt, bumps, road spray), the type of vehicle, and the age of the exhaust system parts. Some warning signs that may indicate vehicle exhaust system problems would include loud rattling noises heard during engine start-up, acceleration, braking, and experiencing drowsiness while driving in or around Troy, Tipp City or Vandalia. McGrath Service Center offers complete automotive exhaust repair and service at our West Milton automotive repair service center. Our mechanics are considered the exhaust system specialists in Miami County and offer complete, affordable exhaust system repair and replacement services for all foreign and domestic cars and trucks.